The Army Chaplains’ Department has existed since 1796. Recruiting from the ranks of Anglican clergymen to begin with, the department broadened its scope in the years before the outbreak of the First World War, covering Presbyterian, Roman Catholic, Methodist and Jewish congregrations. 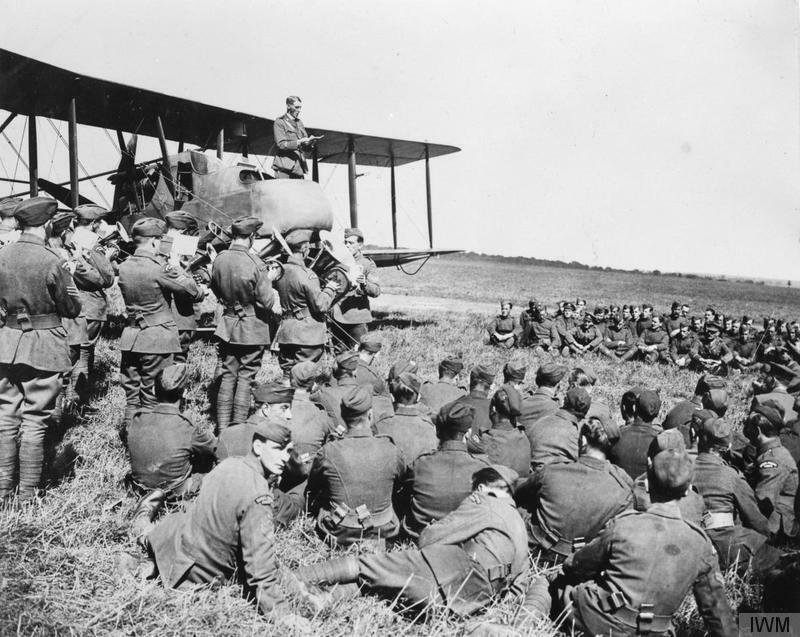 Around 4,400 chaplains served with British armed forces from 1914 to 1918. 179 of them never came home again. Image © IWM (Q 12109) – A chaplain conducting church service from the nacelle of a Royal Aircraft Factory F.E.2b night bomber at No. 2 Aeroplane Supply Depot, 1 September 1918. Note a military band on left in RFC uniforms playing. Chaplains took on various duties while serving at the Western Front, but the common thread which unites them was the welfare of the men they served with. The 3rd Dragoon Guards mention cinematograph entertainments organised by their chaplain, while the 1st East Lancashire Regiment comment on the bravery of theirs, who dressed the wounds of injured men. Chaplains were unique amongst the troops in that they were unarmed, although they did get involved from time to time in military preparations. The 1st King’s Own Royal Lancaster Regiment, for example, records the case of Revered Captain Burrell, who built models of the German lines prior to an anticipated attack. Unarmed or not, Chaplains were often to be found in the thick of the fighting, comforting the wounded, helping stretcher bearers, doing what they could for the men under their care. The 1st East Surrey Regiment diary mentions the Reverend E.J. Sandford, awarded the Military Cross for gallantry. An infantry patrol had gone out to attack a previously located enemy post in the ruins of a village, the Reverend Theodore Bayley Hardy (C.F.) being then at company headquarters. Hearing firing, he followed the patrol, and about four hundred yards beyond our front line of posts found an officer of the patrol dangerously wounded. He remained with the officer until he was able to get assistance to bring him in. During this time there was a great deal of firing, and an enemy patrol actually penetrated between the spot at which the officer was lying and our front line and captured three of our men. On a second occasion, when an enemy shell exploded in the middle of one of our posts, the Reverend T. B. Hardy at once made his way to the spot, despite the shell and trench mortar fire which was going on at the time, and set to work to extricate the buried men. He succeeded in getting out one man who had been completely buried. He then set to work to extricate a second man, who was found to be dead. During the whole of the time that he was digging out the men this chaplain was in great danger, not only from shell fire, but also because of the dangerous condition of the wall of the building which had been hit by the shell which buried the men. On a third occasion he displayed the greatest devotion to duty when our infantry, after a successful attack, were gradually forced back to their starting trench. After it was believed that all our men had withdrawn from the wood, Chaplain Hardy came out of it, and on reaching an advanced post asked the men to help him to get in a wounded man. Accompanied by a serjeant, he made his way to the spot where the man lay, within ten yards of a pill-box which had been captured in the morning, but was subsequently recaptured and occupied by the enemy. The wounded man was too weak to stand, but between them the chaplain and the serjeant eventually succeeded in getting him to our lines. Throughout the day the enemy’s artillery, machine-gun, and trench mortar fire was continuous, and caused many casualties. Notwithstanding, this very gallant chaplain was seen moving quietly amongst the men and tending the wounded, absolutely regardless of his personal safety. He was one of the 179 chaplains killed in action, dying of wounds only weeks before the end of the war, after once again going out to rescue wounded men under fire. 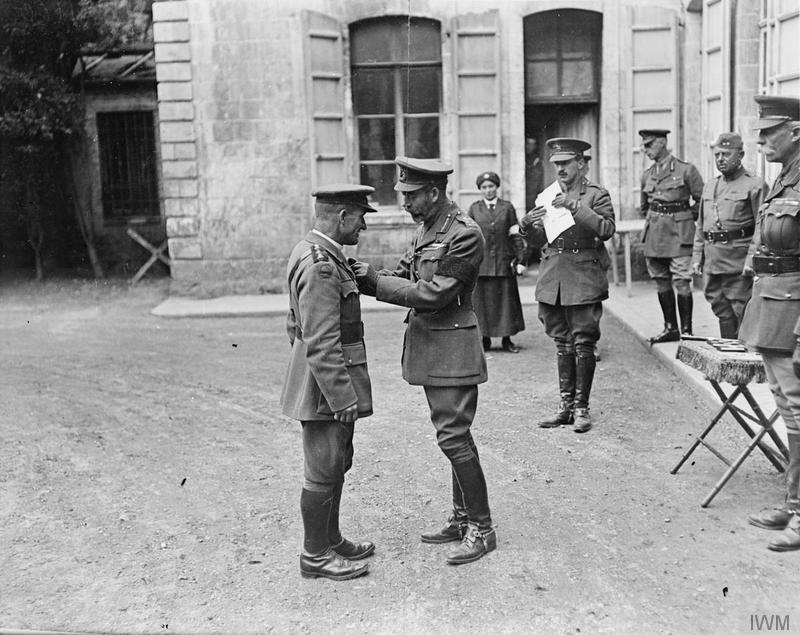 King George V presents the VC to the Reverend T B Hardy, Army Chaplain, at Third Army HQ at Frohen-le-Grand, 9 August 1918. I’m the same as ‘im now and the bloke as sez a word agen our church will ‘have ‘is ****** ‘ead bashed in. The chaplains served a vital humanitarian role on the Western Front. Why not join us at Operation War Diary and help uncover the history of all the other troops they worked amongst?